There about roughly 120 species in the genus Anemone. Several of them that grow on forest floor are called Wood Anemone or Wild Anemone. Anemone nemorosa is the European wood anemone. Anemone quinquefolia and Anemone canadensis are native to North America. Anemone ranunculoides is the Yellow wood anemone. 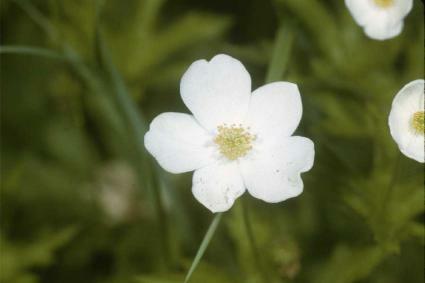 Wood anemones are threatened or endangered species in some locations. Do not collect them from the wild, and if you buy nursery stock, be sure it was nursery-grown. Like other Ranunculaceae, the wood anemone is poisonous. These beautiful spring-blooming flower have green, deeply-cut leaves that grow six to twelve inches high. The star-shaped blossoms are bourn on individual stems that rise above the foliage. 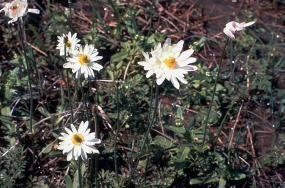 The flowers are usually white, although pale pink and yellow blossoms also appear. Wood anemones prefer lightly shaded, moist locations. They will grow on a variety of soil types, but prefer soil enriched with organic matter. Hardiness varies by species. These plants will form colonies when they are well-sited. They can be propagated by seed or by division. These plants are great in a wildflower garden or for placement under deciduous trees. The roots and leaves are astringent and styptic. The root contains anemonin, which is an antiseptic. Anemone canadensis was used medicinally by the Omaha and Ponca Indians, among others. A decoction of the root was used to treat pain in the lumbar region, and an infusion of the root was used as an eye wash. A wash made from the root or leaves was applied externally to wounds and sores. A tea made from the roots was drunk for headaches and dizziness. European herbalists recommended using wood anemone to treat headaches, agues, and rheumatic gout. Wood anemone is sometimes attacked by specific fungi. A species of Puccinia will damage the leaves, while Sclerotinia attacks the roots. Wood Anemone (Anemone Nemorosa) - In spring this native plant adorns our woods, and also those of nearly all Europe and N. Asia, but so abundant in the British Isles that there is no need to plead for its culture. There are double varieties, and the color of the flower is occasionally lilac, or reddish, or purplish. A sky-blue variety, A. Robinsoniana, is of easy culture and much beauty, especially if seen when the noon-day sun is on the flowers. It is useful for the rock garden in wide-spreading tufts, or for the margins of borders, or as a ground plant beneath shrubs, or for the wild garden or for dotting through the grass in the pleasure-ground in spots not mown early. Other forms worth growing are Connubiensis, the blue wild Welsh form, and a large white form. There are also other blue forms raised, though not yet proved, Alleni and Bluebonnet and purpurea.